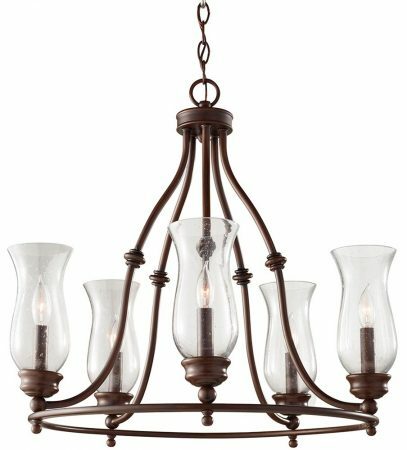 The Feiss Pickering Lane heritage bronze 5 light chandelier with storm glass shades, features tall storm glass shades and candle effect lights for the chic farmhouse look. A country living style chandelier, with a circular ceiling mount and chain suspension finished in heritage bronze. The chandelier body resembles an open birdcage, with the arms curving down for the top and braced with a lower hoop. The five lamps are fitted with a turned bobeche, supporting an inner candle tube and outer storm glass shade. 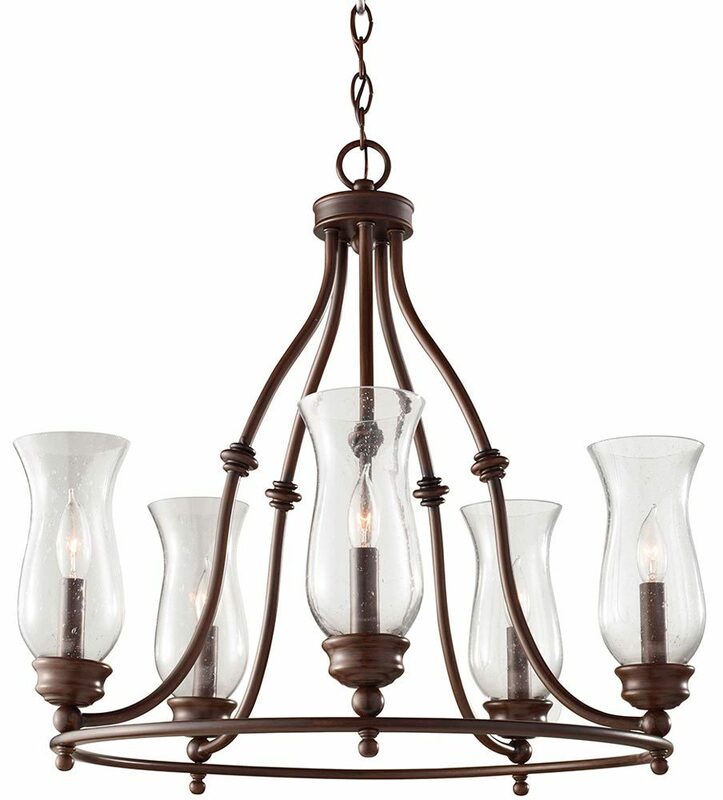 This is a medium sized chandelier that is perfect for a hallway, living room, dining room, kitchen, stairwell or landing. Supplied with 92cm of chain suspension that can be shortened at the time of installation to achieve the desired ceiling height. Please see technical information below for minimum and maximum heights. The Pickering Lane heritage bronze 5 light chandelier with storm glass shades, designed in the USA by Feiss, founded in New York in 1955. They have become well known over the years for their contemporary yet classic styling, quality and great original designs. Feiss continue to maintain the highest standards in materials and workmanship to this day.